Friday, October 1, about 6 AM, just minutes after ten big hotels locked out 2600 San Francisco hotel workers. A small van full of scab wannabees pulls into the white zone in front of the small downtown hotel where I work. Just a few feet away dozens of locked-out St. Francis hotel workers have already set up a loud and boisterous picket line near the employee's entrance. I had gone out to the curb to see who was pulling into the white zone. As I was approaching the scab van, the driver rolled down the window and asked urgently, "Brother, where is the St. Francis hotel?" I, of course, gave the proper directions to this dumb, deaf and blind traitor to his class. The incident with the scab van is only one small example of the disarray and disorganization of the hotel owners. UNITE HERE Local 2 had struck four hotels on Wednesday morning. Although the owners of the 14 hotels in the Multi-Employer Group (MEG) had threatened a lock-out of all their hotels if the union struck any of them, it took them two full days to get their lock-out together. By comparison, during the last citywide hotel strike in 1980, the hotel bosses locked out union members at 24 hotels the same morning that Local 2 pulled a set of hotels out on strike. There are a couple of theories circulating to explain the bosses' delay. One is that they didn't have their scabs in place when the strike began. The incident with the scab van gives this theory some confirmation. More significantly, there are reports that the hotels have even been cruising the day laborers on Cesar Chavez Street looking to recruit scabs, without much success. There is already a Spanish-language leaflet on the street explaining the strike situation, and Renee Saucedo, the Director of the Day Labor Program (and a candidate for Supervisor in District 9) has been on Spanish-language TV stations 14 and 48 urging day laborers to honor the strike. Of course, many of the day laborers have friends and relatives who work in the hotels, and are now also on the street. Another theory circulating to explain the hotel bosses' delay in getting their lockout together is that they are deeply divided among themselves on strategy and tactics in the negotiations. On Wednesday, the day the union called workers at four hotels out on strike, many hotel General Managers seemed to disappear from sight, suggesting that they were off in some kind of difficult confab with each other. If they had their act together, one would have expected them to be very present in their respective hotels battening down the hatches and implementing their supposedly prearranged strike plans. There are, of course, several different hotels and hotel chains involved, with varied market positions to protect, each with somewhat different historical relations with the union. More importantly, the presence of national corporate representatives from the big chains has been much more pronounced than in past negotiations, which inevitably raises some conflicts between the relatively-remote corporate offices and the on-the-ground hotel bosses who have to deal with the conflict in a much more direct way. Finally, the big hotels are much better positioned to weather this storm than the many smaller hotels. Although the smaller hotels, and some of the big ones, are not part of the MEG bargaining unit, they have plenty of reasons to worry about how a prolonged struggle might affect their bottom lines, both now and in the future. The national dimension of this battle ups the ante considerably. On Friday, the same day the San Francisco lockout began, thousands of hotel workers in Atlantic City casinos went out on strike. Meanwhile, thousands more hotel workers in Los Angeles and Washington D.C. continue to work without a contract, and could well be called into the streets by the union at any moment. The national character of this struggle also comes into play as a result of the union's desire to negotiate two-year contracts in San Francisco, LA and DC. The union's reason for this is simple. Major hotel contracts will expire in two years in New York, Boston, Chicago, Honolulu, Seattle, Detroit, Philadelphia, Toronto, Monterey and Sacramento. Although the union leadership is not seeking a national master contract, they believe that hotel workers would have significantly more power if they can line up bargaining for all of these cities at the same time. The fierceness with which the hotel bosses are resisting a two-year contract suggests that they have the same analysis as the union. 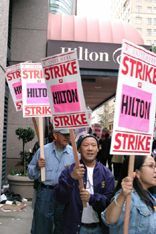 The union leadership has made an issue of the fact that the hotel industry is today dominated more and more by national and international corporations, such as Hilton, Hyatt, Marriott and Starwood (which owns the St. Francis). It only makes sense that the union would also want to deal with the hotel bosses from a national perspective, rather than be cut up one-by-one in different cities around the country. The MEG ran a big ad in the Chronicle on Friday, claiming that "an agreement can be reached on all issues -- except one... the duration of the contract." This is nonsense. There is a vast gulf that separates the hotels and the union on all the major economic issues -- health care, pensions and wages, just to name a few biggies. The MEG ad goes on to whine that "a two-year deal and the imposition of a hard-line 'take it or leave it' national labor agenda has halted process..." This, of course, is more nonsense, and turns reality on its head. It is actually the hotel bosses who have refused to bargain seriously on economic issues as long as the Local 2 proposal for a two-year contract is on the table. The MEG ad complains that only a five-year contract would "provide stability." How much nonsense can they expect us to swallow? The hotels and the unions negotiated several three-year contracts in the aftermath of the 1980 strike, a period of considerable "stability," at least for the hotel bosses. Few hotel workers seem impressed with the MEG public-relations spinmeisters. The picket lines at the fourteen hotels are holding strong, and the spirit on the street is very high. Join us.